Lux and lumen are units of measurement for headlights – but what do they actually mean? The luminous flux, stated in lumens, describes the total light emitted by the light source, but does not reveal anything about the direction or uniformity. It accordingly refers to the total quantity of light that shines from the headlight onto the road or into the sky. The illuminance in lux describes the intensity of light on an illuminated surface – in other words, how much light hits the road at a distance of 10 m.
What bicycle lights are right for me? 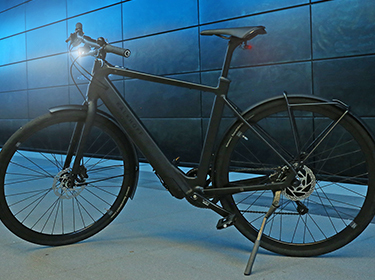 Those interested in city, touring, and trekking bikes opt for a smooth-running hub dynamo and LEDs, whereas sportspeople favour lightweight battery-powered lights, that can be conveniently charged via USB.